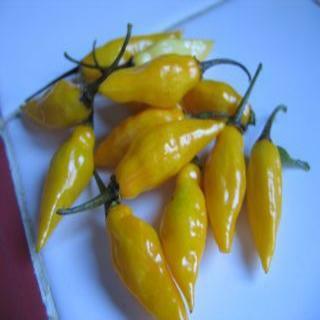 Limon Chile peppers are small pendant shape fruits with a delicious smoky-citrus flavor. Plants will be completely covered in peppers. Heirloom Seed Packet. This is our favorite chile here. Thin fleshed, crinkled, bright lemon gems are extremely hot. Small pendant shape fruits have a delicious smoky-citrus flavor. Plants will be completely covered in peppers. Make some dry spice rub to put on fish and chicken by drying in your electric dehydrator, then grinding in a mill. We can quarts of hot sauce by boiling a full pot of peppers in 1/2 vinegar ( white or apple cider ) to 1/2 water and then pureeing in a processor. It tastes just like lemon and is crazy good!